Tuesday, June 9–We woke up early to pack enough clothes for a two-day jaunt, store our excess baggage and make our way to Mysore, another city in Karnataka, about 90 miles from Bangalore. We stopped at two places as we went. Our first stop was the Indian Institute for Journalism and New Media. We had met with the institute’s vice dean, Kanchan Kaur, and a broadcast professor, Surekha Deepak, earlier in the week to discuss our stories, and they provided us with feedback and suggestions for sources. On Friday night, Kanchan and her husband had had us over to her home for dinner, so we felt like old friends at this point and wanted to see her school. We were shown around the beautiful, open campus by an alum who now works at the institute. The campus had lecture halls, a TV studio, a soundproof radio studio, faculty offices and a computer lab workspace. Since local temperatures are always warm, the buildings are open-sided, and there are some amazing views of mountains in the background. We students were saying how we wouldn’t be able to concentrate on our work there because we would just stare out the window all day. Next, we stopped at the summer palace of Tipu Sultan, who ruled the Kingdom of Mysore in the late 1700s and is recognized as one of greatest South Asian rulers of all time. The palace is now a museum. We had an animated tour guide who liked to talk very fast and use a lot of hand motions. He was entertaining. Then it was on to Mysore to see the Maharajah’s big palace, which opened in 1912. We were in awe when we laid eyes on it. It was huge, and the architecture was so intricate and beautiful. Right as we got to the entrance, it started pouring, so we ran under an archway where we huddled with other palace visitors. To enter the palace itself, we had to take our shoes off, which was an experience as few of us are used to walking around barefoot in a place so public, especially after a heavy rain. The inside was as beautiful as the outside, but we weren’t allowed to take pictures indoors. The ceilings were covered in designs in gold, blue and magenta paints. Afterward, we went on an audio tour of the residential part of the palace. We saw how the family lived, what kinds of weapons the royal army used, the toys and musical instruments the children played with and how the royal family transported the children in carriages. As we picked up our shoes, we saw two camels standing nearby and realized we could go on a camel ride for only 30 rupees, which is less than 50 cents. All of us decided we just had to ride the camel, an experience that turned out to be scarier for some than for others. To get on the camel, we climbed these old wooden stairs that seemed about to collapse. Two of us could ride at a time although some families piled as many as four small children onto the camel at once. Being on the camel at first felt strange and lopsided, but once you started moving, it was a rush of adrenaline being so high off the ground. 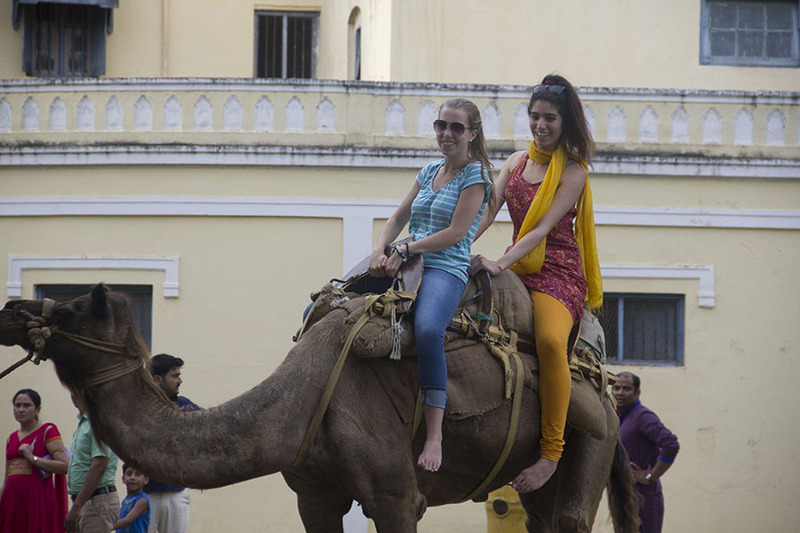 In the end, we all had a lot of fun on the camel, and at Mysore. This entry was posted in Blog and tagged camel ride, IIJNM, JWWIndia, Kanchan Kaur, Mysore, Surekha Deepak. Bookmark the permalink.